Yahoo releases its first report on diversity and like other Silicon Alley companies shows it is overwhelmingly male, mostly white and Asian. Yahoo, one of the most prominent Silicon Valley companies with a female CEO, still has an overwhelmingly male work force and leadership. The company released its first diversity report late Tuesday and it showed that 62% of its global work force is male. But many of the women are in the lower-paying non-technical and non-leadership positions. The company said 85% of its technology staff is male, as is 77% of its leadership. 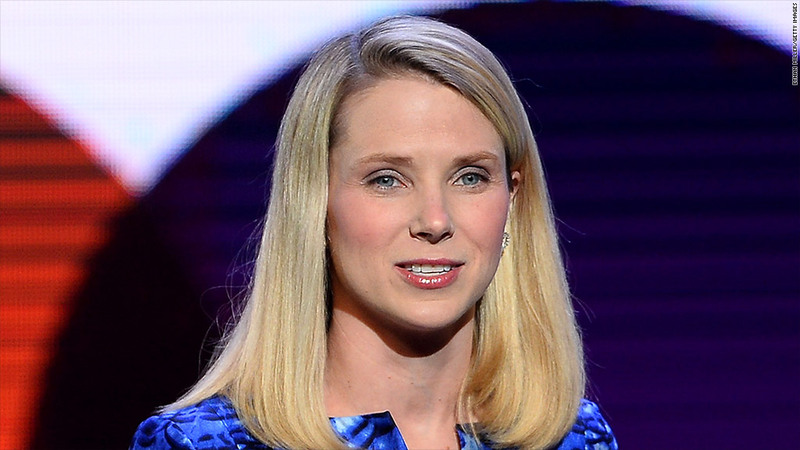 Marissa Mayer has been CEO of Yahoo (YHOO) for nearly two years, and she is the second woman to lead the company. Carol Bartz served as CEO for nearly three years before she was fired in September 2011. Yahoo also had a woman president, Sue Decker, for nearly two years before she left in 2009. The report also shows that 50% of Yahoo's U.S. employees are white and 39% are Asian. Only 6% are either black or Hispanic. The company also said that 57% of tech workers are white and 35% Asian, while 78% of leadership is white and 17% is Asian. The company's founder and long-time CEO, Jerry Yang, is Taiwanese-American. Yahoo had previously reported that as of the end of last year it had 12,200 full-time employees and fixed-term contractors. "These statistics are only a part of the story -- Yahoo works to ensure that our existing employees feel welcome and supported during their time at the company," said the company's statement that accompanied the report. There has been renewed focus on the relative lack of diversity at companies in Silicon Valley. The nation's overall population is about 63% white, 17% Hispanic, 13% African American and 5% Asian, according the Census Bureau. And the Labor Department reports that women make up 49% of those with jobs. Civil Rights activist Jesse Jackson has appeared at several annual meetings of tech companies this spring, including Google (GOOGL) and Facebook (FB), to urge them to do more to recruit African American and Hispanic workers. At the end of May Google released its diversity report for the first time that showed 70% of its staff is male and 61% is white, while 30% is Asian. Linkedin (LNKD) also had released its diversity report last week which showed 61% of its staff is male, while 53% is white and 38% is Asian.